The society’s activities — books, periodicals, annual conferences, discussion groups, awards, and more — are made possible by membership dues and donations. Site map for our new website. The latest Mythopoeic Society news. The Mythopoeic Society is a 501(c)(3) non-profit corporation and donations are tax-deductible, as allowed by law. Did you know ...the Mythopoeic Society sells assorted goodies, in addition to our excellent publications and the books we publish? Please visit our store and wander through. 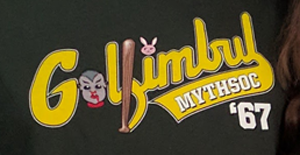 We Now Have Golfimbul T-Shirts! The first Progress Report for the Mythcon 50 (August 2-5, 2019, in San Diego, California) is now available and Room & Board packages are now also for sale. The conference theme is Looking Back, Moving Forward. Our award-winning Guests of Honor will be John Crowley, Author GOH, and our Scholar GOH will be Verlyn Flieger. Do join us in beautiful San Diego this August! Register here. Did you know ...you can also support the MythSoc when you follow our links to Amazon? The price is the same but the Society gets a little bit from your purchase. 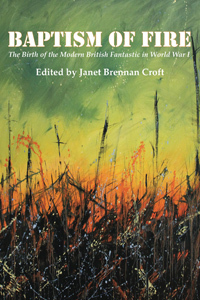 The latest from The Mythopoeic Press, Baptism of Fire: The Birth of the Modern British Fantastic in World War I. Edited by Janet Brennan Croft. The Mythpress is most honored that two recent titles have been nominated for British Science Fiction Association award for Nonfiction: Perilous and Fair (co-edited by Leslie Donovan and Janet Brennan Croft) and Baptism of Fire (edited by Janet Brennan Croft alone).